After a couple gallons of homemade electrolyte replacement sports drink, a hoard of supplements, and a few good nights of sleep, I’m back to work and ready to continue telling you about my amazing adventures in the Holy Land. Even with my best efforts, I came home depleted and needing rejuvenation. That’s what ten days of profuse sweating, walking miles and miles and miles in the heat (up hill both ways, mind you), 18-hour days, and 3-5 hour nights can do. But it was oh-so very worth it! 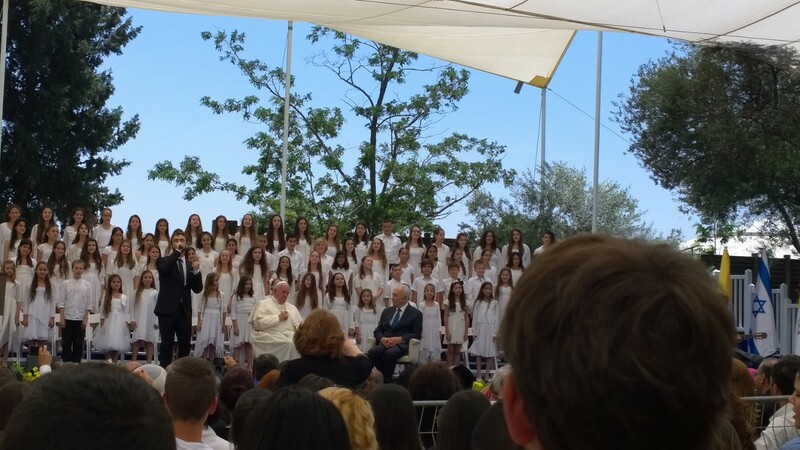 I promise to continue blogging about the holy sites, but today I want to write about THE event that occurred while I was in Israel – Pope Francis’ historic meeting with Ecumenical Patriarch of Constantinople, Bartholomew I. 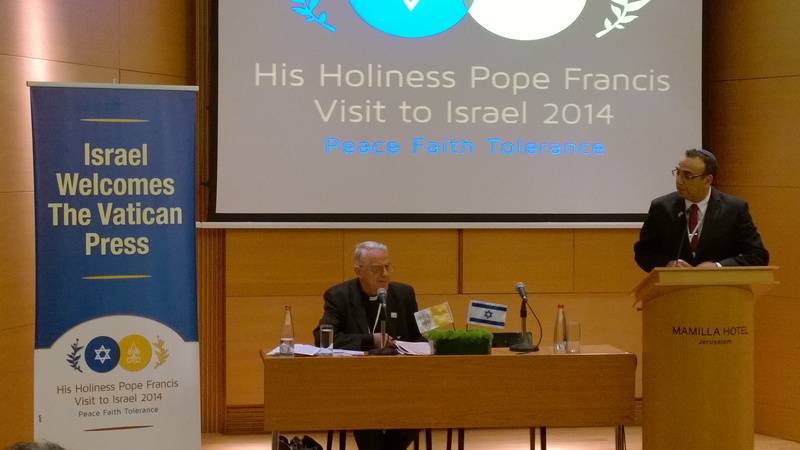 The meeting, which took place May 25 in Jerusalem, commemorated the 50th Anniversary of Pope Paul VI’s meeting with then-Patriarch Athenagoras. Both meetings had the intent of moving toward unity between East and West in the Catholic Church. 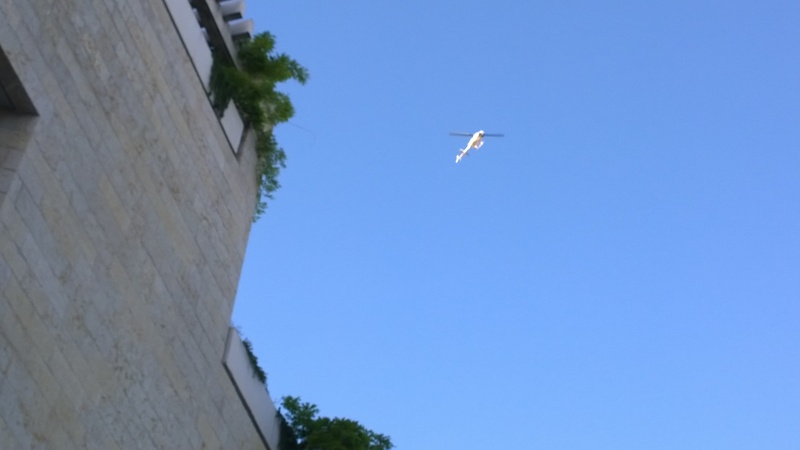 The papal helicopter arrives in Jerusalem for the historic meeting of Pope Francis and Bartholomew I. Taken from our hotel terrace. While we weren’t able to cover the Pope-Patriarch meeting directly, my colleagues and I could feel the electricity in the air and sense the monumentality of what was unfolding within our proximity. There were welcome signs and banners everywhere, rejoicing over the encounter between Peter (Pope Francis) and Andrew (Patriarch Bartholomew). How could we not feel that same rejoicing in our hearts? I encourage you to read the shared statement issued after the meeting, and to read the official news reports of the event. Also awesome, is the proposal from Bartholomew I that he and Pope Francis meet in Nicea in 2025 to mark the anniversary of the First Council of Nicea, which took place in 325 A.D. The initial news reports that I read stated that the Bishops of Rome and Constantinople had signed a statement about the meeting, indicating that it would be an effort to resolve the centuries-old disagreements between the Catholic and Orthodox Churches. Certainly, great strides have been made in reaching toward unity, but the Nicea meeting is still in its early stages, as Vatican Press Secretary Father Federico Lombardi said. Press briefing with Vatican Press Secretary Father Federico Lombardi, SJ. Speaking of Father Lombardi, our little group of Catholic Press Association journalists was invited to participate in a press conference after the historic meeting. After a considerable time waiting around, we were told that the briefing was open only to the Vatican Press Corps, but that we were welcome to hang around and partake of the spread of food and drink available. I don’t know if others in my group expressed their, uh, disappointment to the coordinator, but I did, as diplomatically as I could. Shortly thereafter, we were whisked down some back stairs and ushered into a small auditorium. We were in! That, for me, hit 10 on the way-cool spectrum! As is true of most significant events, Father Lombardi could say very little at this initial briefing. He did, however, tell us that the meeting between Francis and Bartholomew I was good – so good, in fact, that it pushed the entire schedule back by an hour. I have a feeling that we’ll be hearing much more about the meeting and it’s impact in the coming weeks. As an aside, I have to mention that Bartholomew I stayed in our hotel – or we stayed in his – and his room was just down the hall from mine. Either way, we again hit the top of the way-cool spectrum. His security personnel and staff were all about the hotel (David Citadel in downtown Jerusalem), and so we had a close up view of the Patriarch’s comings and goings. Not only could we see, but we also could feel the importance and excitement of the meeting of Peter and Andrew! The next day, Pope Francis and Israeli President Shimon Peres met at the Presidential Palace to discuss Middle Eastern peace. The two met privately, then planted an olive tree together in the Prime Minister’s garden, and finally issued separate statements in a formal ceremony. My colleagues and I participated as members of the press, which was absolutely thrilling. That morning I posted on Facebook, “At the presidential palace. Lots of guns and men wearing suits and sunglasses.” There certainly was! Security was thicker that pea-soup fog, and that, too, was part of the thrill as well as numbering among the AP, Reuters, and other news agency reporters. Best of all, of course, was being 50 ft. from the Holy Father. I’ve seen him dozens of times on news clips and videos, but seeing him in person is another story. I wanted to observe his mannerisms and hear his voice. I wanted to know if he’s as gentle and loving in person as he is in print and on screen. He is; even more so. 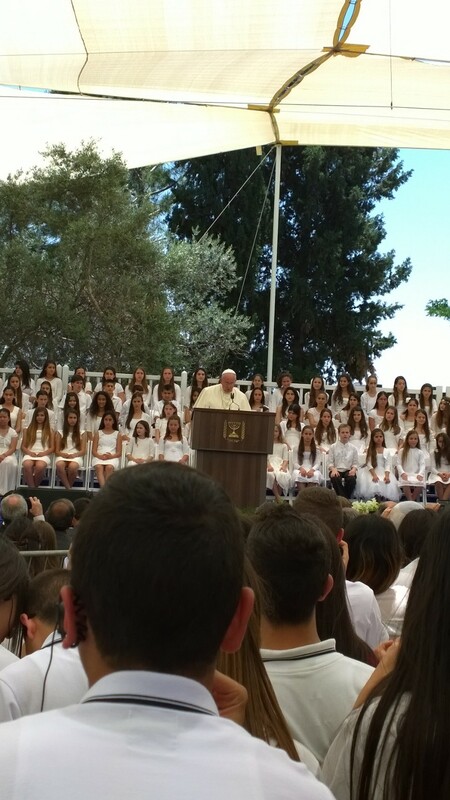 I recorded the Pope’s statement, and am working on editing a clip for you, so stay tuned. For now, here’s the full text of the Pope’s statement. 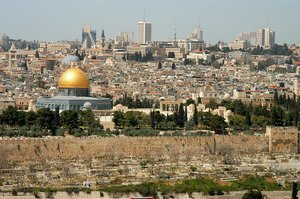 The big news from the Pope’s political meetings is his invitation to Israeli President Shimon Peres and Palestinian President Mahmoud Abbas to come to the Vatican to pray together with him for peace. Both presidents immediately accepted Francis’ offer, and the event will take place June 8. I will write about this in an upcoming blog, but I can tell you that I personally am grateful for the Holy Fathers initiative. I learned an awful lot about Israeli-Palestinian relations when I crossed the Separation Wall between Israel and Palestine on the way to Bethlehem. I loved being part of the international press scene, and I hope that I’ll have that opportunity again soon. Right now, though, I’m happy to be back home with my family and sharing about my trip with you on this blog. My apologies to you, dear readers. Obviously, I’ve got a corrupt file embedded in my post. The last pic is Pope Francis giving his address at the Presidential Palace. “Someone” is enjoying messing with my blog today!